Our framing nailer reviews include both stick and coil models for the carpenter or framer. We target our writing to those who needs to rely on a nailer all day long. Let’s face it—on the jobsite you can’t afford to have a tool slow you down. 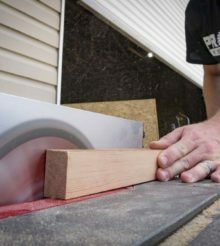 Also be sure to visit our best framing nailer shootout article to see what we thought of the current crop of tools. The framing nailer must have certain features and performance metrics to stand up to our rigorous testing. This includes dry fire lockout, an easy-to-load magazine, and 2-stick capacity. It needs to handle well and feel ergonomic in the hand. It also must fire hard enough to drive 3-1/2 inch 16d framing nails into a stud wall. Most of our reviews are done by professionals in the field, or utilized in a similar capacity by our Pros. We aim to understand how each tool will perform the job of quickly fastening 2×4 studs and/or other similar materials.